Apple's three digital storefronts will see significant changes with the launch of iOS 6, including new looks and new functionality for the App Store, iTunes Store, and iBookstore. 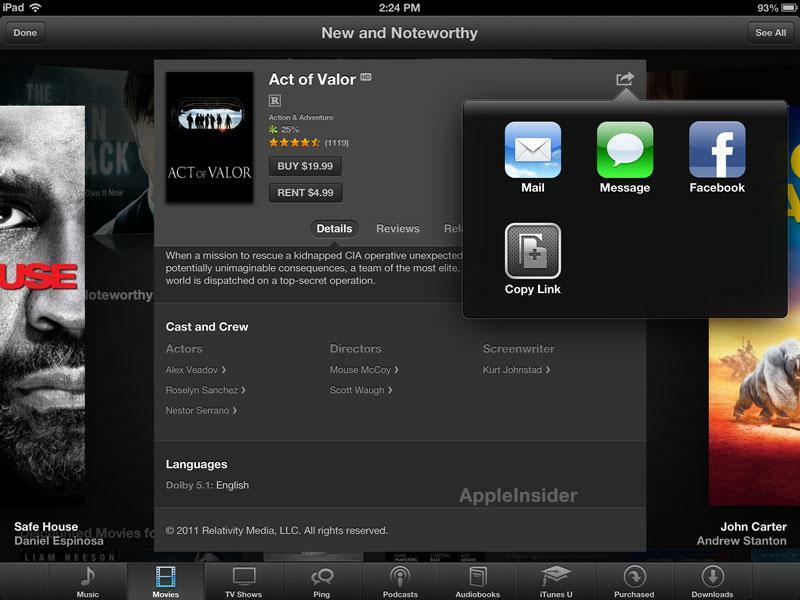 The new App Store in iOS 6 has a black theme at the top and bottom, with a number of user interface tweaks throughout. On an iPhone, the "Featured" page allows users to now scroll from left to right to view applications under the "New" and "What's Hot" categories. 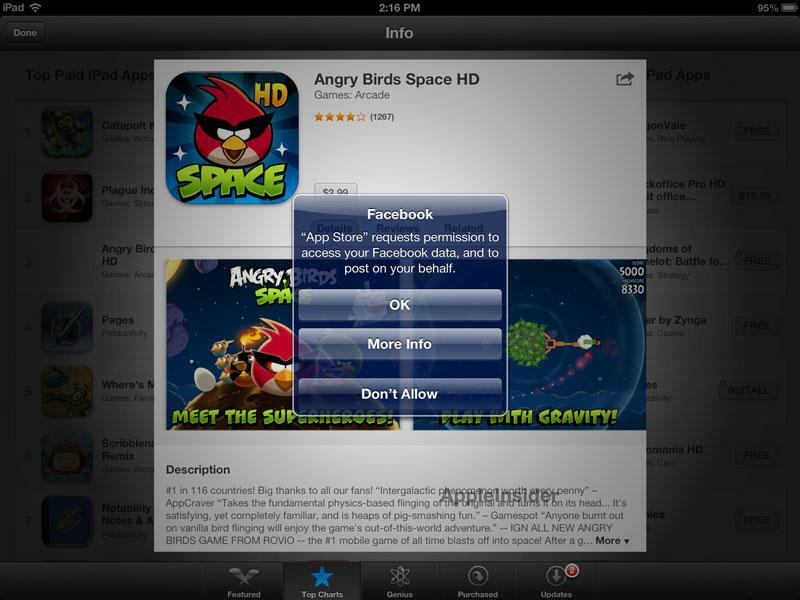 When buying and updating applications on the App Store, users are no longer sent back to the home screen in iOS 6. Instead, the installation begins in the background and users can continue to browse the App Store. Users are reminded of what applications they just installed when they return to the home screen with a blue badge that appears in the top right corner of the application icon reading "New." When an individual application is selected on the App Store, users are presented with selectable options for "Details," "Reviews" and "Related." In the current developer preview of iOS 6, Genius for software on the App Store is not yet available on either iPhone or iPad. Apple has also added Share Sheets buttons to the top right corner when content is being viewed in the App Store, iTunes Store or iBookstore. This allows users to share that content via Mail, Message, Twitter or Facebook, or copy the link to paste elsewhere. 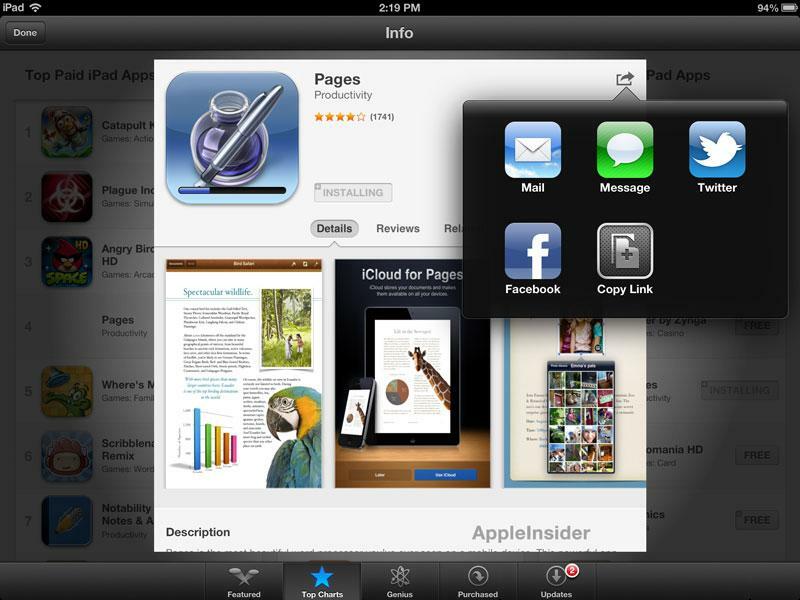 The new iTunes Store and iBookstores also features a darker look and similar icon style to the redesigned App Store. 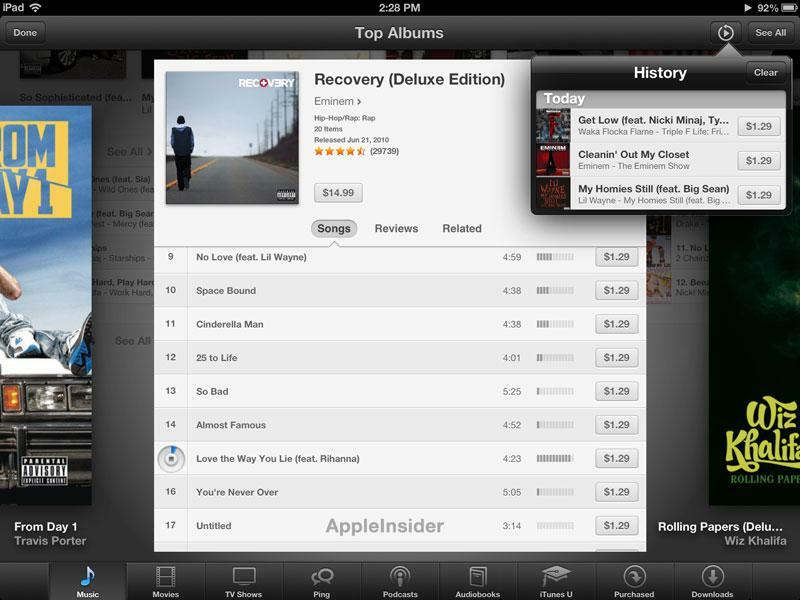 In iTunes, similar set of selectable tabs are available when users load up an album in the music section, providing "Songs," "Reviews," and "Related." 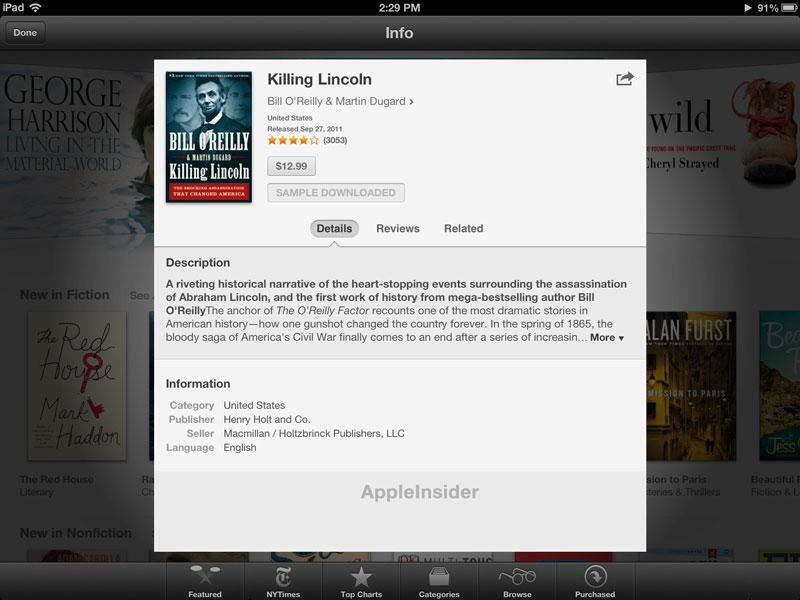 On the iBookstore, these are "Details," "Reviews," and "Related." One new addition allows users greater flexibility when previewing a song. Controls for the preview appear at the top of the screen, and users can browse other options like Movies or TV Shows, or even close the iTunes Store application, while the song preview continues to play. Previewed content is also synced through iCloud, so a user can shop the iTunes Store on their iPhone and later continue on their iPad, complete with a history of what content they were looking at. Still included in the new iTunes Store is Ping, even though Apple Chief Executive Tim Cook hinted at last month's D10 conference that his company could kill off Ping, after it has failed to gain traction with consumers. However, while a link to Ping remains, the service is listed as "not currently available in iOS 6," much like Genius. "See the best of whats new in music, movies, TV shows, apps, and books at the top of each stores home page," Apple's official description of its updated storefronts in iOS 6 reads. "Browse with a swipe of your finger and tap to learn more. Keep track of the music, movies, and TV shows you previewed by tapping the History button, and when you're ready, tap Buy to add something to your collection."